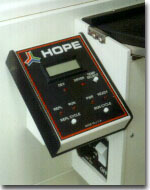 ***Please note Hope Processors are not available in USA anymore. We still have ability to provide parts by calling 573-308-4448. Otherwise, please consider the German made Protec Optimax Processor. PodoMAX's "dual" automatic replenishment system may replenish either by measuring film area or by flooded replenishment with manual operation back-up! Automatic energy and water saving standby system with built-in jog feature. Manual operation back-up! Cold water operation - no hot water required! Hope X-Ray offers a TWO YEAR warranty on all parts. Affordably priced - the PodoMax provides more features and benefits for less! Can you afford less than the best? remember, HOPE products deliver quality!